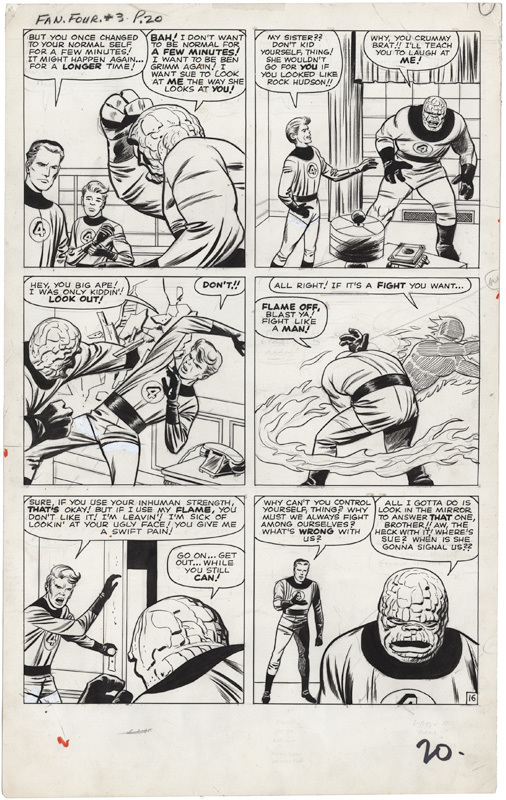 Concerning Marvel Essentials: Fantastic Four Volume Two, Covering Fantastic Four issues 21-40 and Annual 2, and Strange Tales Annual 2. 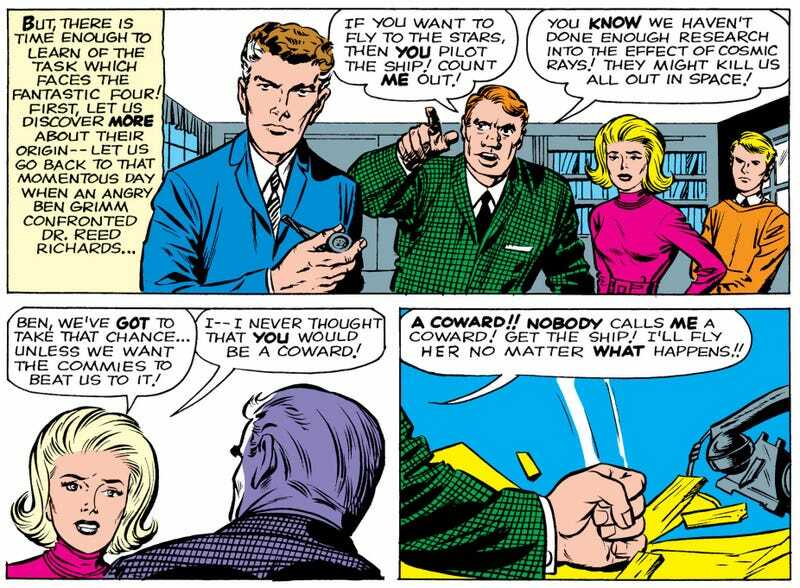 It was more than Johnny being “hot headed,” Reed being scientifically preoccupied, Sue being a poorly realized 1960s woman and Ben being the monster again. They were genuinely awful to each other. The Thing defends a man being attacked at one of The Hate-Monger’s pro-Trump rallies, the Hate-Monger retaliates by firing his “Hate Ray” (sponsored by Fox News) at the team. They fail their saving throw and almost instantly start quarrelling with each other and they disband. Yoko ain’t got nothing on the Hate-Monger. Back at the Baxter Building Nick Fury (think young Charlton Heston) is there to enlist the FF’s help searching for his lost shaker of salt in the South American country of San Gusto, Reed decides to go by himself, Fury is not a fan of that and he recruits the other three former team members. Blah-blah-blah, it all goes down and The Hate-Monger is killed by his own bodyguards and is revealed to be Adolf Hitler and Harvey Keitel gets to shove a pineapple up his bum for the rest of eternity. 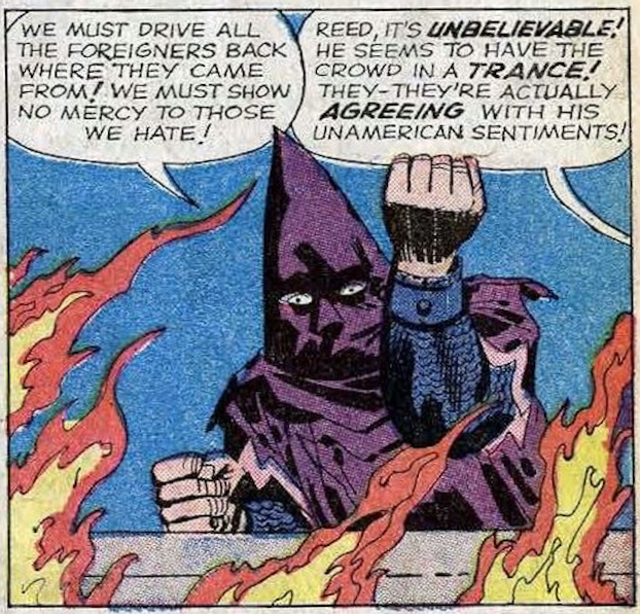 I have no doubt that the Big Reveal of The Hate Monger’s true identity was definitely a Kirby plot point, that sort of crazy development is certifiable Kirby. TS: In the first 20 issues the team were really mean spirited. STAN: Well, we were going for a family feel. TS: But they were almost abusive. STAN: They could be pretty bad. TS: They seemed nicer to one another. Was that intentional?